Amy McArthur Macgregor was born on the 29th January 1869 in Annfield House, Kirn, Dunoon, Argyle, Scotland. She was the eldest daughter of John Macgregor (the second son of John Macgregor of Finnart and Margaret Fleming) and Sarah Jane Hicks. Sarah Jane died on the 18th September 1880 at the family home in Dunoon and in 1881 Amy was living at 4 Jews Walk, Upper Sydenham, Lewisham, with her father, her four youngest siblings and four servants. 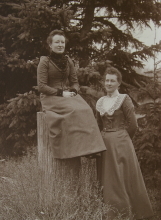 She emigrated to Canada in 1890, with her sister Ethel and possibly her brothers James and Edwin. It is possible she also travelled with her future husband James; as he emigrated in the same year. She married James William Matthews (born 17th June 1865), on 27th of September 1895 in Winnipeg, Manitoba, Canada. They lived at 320 Colony Street. James was a licentiate of the Royal Academy and Royal College of Music / (Concert Organist's Diploma) and worked as a music teacher and, as many music teachers did at the time, described himself as a Professor. He was the organist of the Central Congregational Church in Winnipeg. He was also an adjudicator at the first Edmonton Kiwanis Music Festival in 1908. In the 1901 census he claimed an income of $1,000. James was a well knows teacher and was frequently mentioned in the Manitoba Free Press. In 1904 a former pupil, Eva M Gray, obtained 1st class distinction by first class honours in the four subjects entered for the Toronto College of Music. 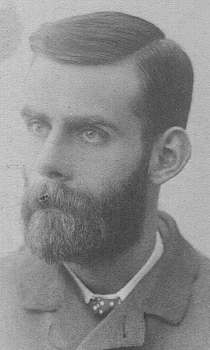 In 1907 he was described as "one of our most reliable organ teachers", he was reported as being very busy! In 1908 James was on the executive committee of the Winnipeg Orchestra. In the 1906 census they were found at 320 Colony, Winnipeg with the three eldest children one servant and Ellen Hicks, a "boarder" born in 1869 in England and having emigrated in 1903. · William McGregor Matthews: Born 24th August 1896 in Winnipeg. · Harold Whitehouse Matthews: Born 18th August 1898 in Winnipeg. · Joseph Leonard Matthews. Born 1906 in Winnipeg. · James Hubert Matthews: Born about 1908 in Winnipeg. Some time after 1907 they moved to 141 Spence Street Winnipeg, and were there at a wedding on 22nd of Feb. 1917, when Annie Edith Yorke married Phillip Henry Gerrish. James William Matthews died on the 26th September 1924 at St Boniface Hospital, Winnipeg and was buried at Elmwood Cemetery. Amy carried on living at 141 Spence Street, but in 1937 is reported at 248 Langside Street. She did not stay long here, because in 1942 her sister Ethel then went to live her and they moved to #3- 100 Rose Street (Melrose Apartments). Ethel moved to Cornwall, Ontario in 1946 and around that time Amy moved to 1100 Garfield Street and lived with her son Joseph. Amy died on the 6th of February 1958 at Princess Elizabeth Hospital and was buried at Elmwood Cemetery.